The oil and gas industry paid over $15.7 billion in Texas state and local taxes and royalties in fiscal 2014 and a total $98.9 billion in Texas state and local taxes and royalties from 2007 through 2015. The taxes paid go toward funding Texas schools, textbooks, Medicaid and children’s health insurance programs, child protective services, roads and first responders such as a police and firefighters. The oil and gas industry includes exploration and production, pipelines, refining, petrochemicals, natural gas distribution, petroleum, refining, petrochemicals, natural gas distribution, petroleum products wholesaling, and oilfield equipment manufacturing. Oil and gas companies pay far more in state and local taxes and royalties on a per worker basis than does the average private sector company. In fiscal 2009, oil and gas companies paid an average of $27,000 per employee in state and local taxes and royalties. By comparison, other private sector companies averaged only $4,800 per job. This five-fold difference highlights the critical role of oil and gas plays to keep the Texas economy – and Texas government – viable and resilient. 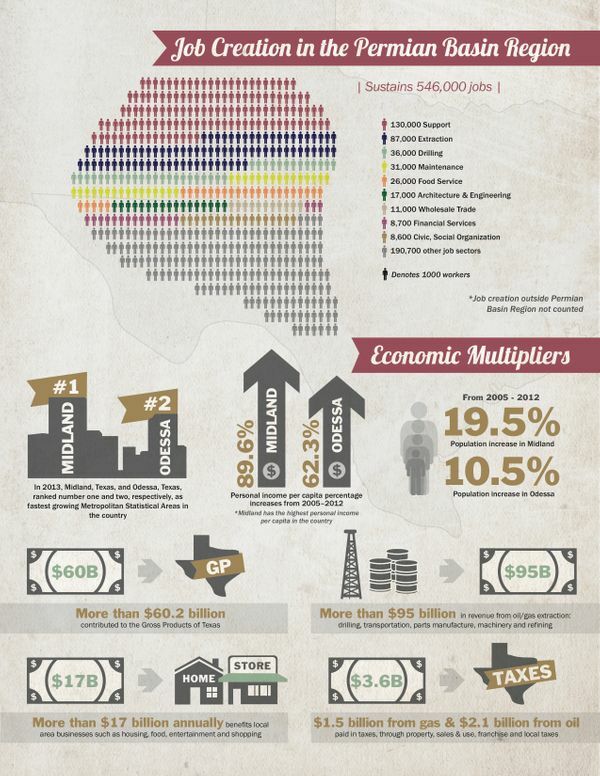 Oil and gas employers directly provide more than 400,000 high-quality, high-paying jobs in Texas. The average oil and gas worker earns about $120,000 a year, more than double the rest of the private sector workforce. Given the large capital outlays and other expenditures that accompany oil and gas jobs, each job tends to generate many other jobs in Texas, creating a “ripple effect.” According to one economic model, manufacturing at nearly 17 additional jobs created for every oil and gas job. 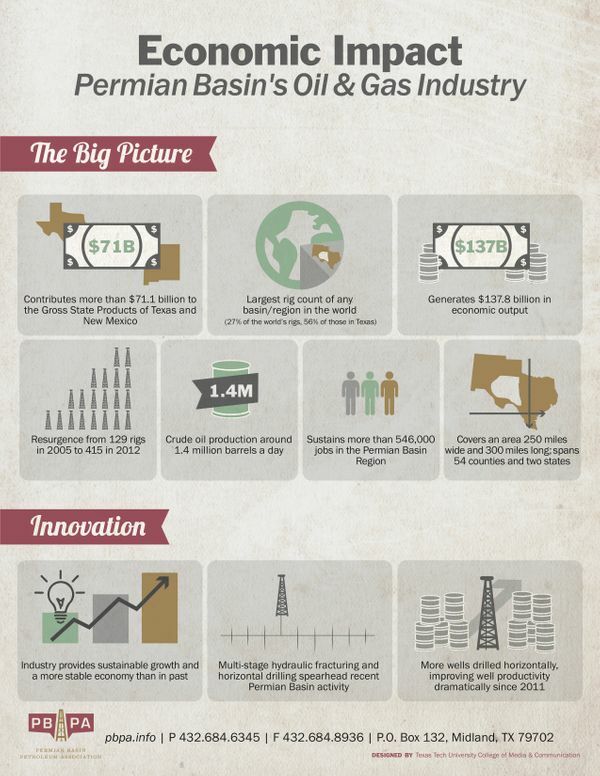 The second highest multiplier in Texas is in petroleum refining, creating 14 additional jobs for every refining job. The ripple effect stems from the purchases that oil and gas companies make, including cor machinery, pipe, fuel, raw materials, concrete, steel, engineering services, legal services, well services, electricity, maintenance, construction, and land, as well as pay to their employees. Texas maintains an Economic Stabilization Fund (ESF) or “Rainy Day Fund”that is funded almost exclusively by oil and gas taxes. Transfers of collected taxes for the ESF began in 1987, but in fiscal 2009, the transfer to this "Rainy Day Fund" was a record $2.2 billion, all of which came from oil and gas taxes. In fiscal 2017 the transfer was another $1.5 billion, allowing the Rainy Day Fund balance for the 2018-19 biennium to grow to $7.5 billion. The Rainy Day Fund has been used to help close budget shortfalls, provide property tax relief, and to fund public schools; teachers’ compensation and health insurance; Medicaid; children’s health insurance; child protective services; foster child care and adoption services; criminal justice programs; funding for the Emerging Technology and Texas Enterprise Funds; and, disaster recovery programs. As a result of a constitutional amendment passed in 2014, a portion of the oil and gas taxes previously designated for the Rainy Day Fund are now transferred to the State Highway Fund, contingent on legislative action. With oil and gas operations continuing to grow in the state, particularly in the Permian Basin, it is highly likely that additional taxes will be paid by oil and gas companies in subsequent budgetary periods that will further benefit the ESF, State Highway Fund, and the state programs financed by both.